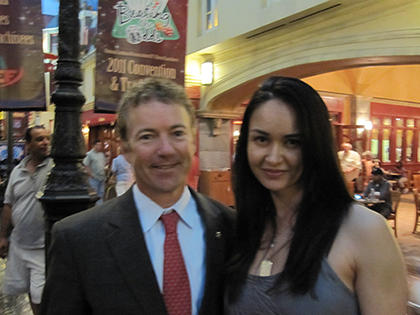 The Freedom Friend, Michelle Liberman, and Senator Rand Paul. "Finally! A politician who stands up for the Constitution - the law of the land which was written to limit the government's power, not expand it. So that We the People can truly have the FREEDOM to life, liberty, and the pursuit of happiness." Do you want to know why Republican Senator Rand Paul standing up, fighting for our rights, and telling the truth about the Obama administration trampling on the Constitution is good for you? If you don't already know the answer, here it is: it's because every country in the world, modern and ancient, that has citizens with limited freedoms and prosperity, have their liberties taken away by the overreaching powers of their governments. A government trampling on your rights screws with the quality of your life.